Julie Bannerman and Louise Mckenzie. 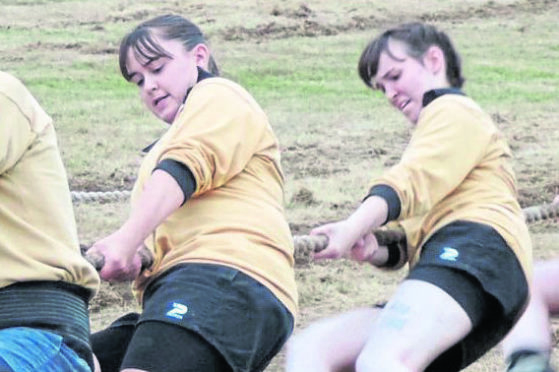 And now, a pair of Tug of War stars from Cornhill, near Banff, are on their way to the World Championships in Cape Town this week. Louise Mckenzie, 18, and Julie Bannerman, 27, have paraded their talent for their club in recent seasons and won a stack of honours in the process. But they are only making the journey to South Africa after launching a crowdfunding campaign to represent their country. Nothing daunts this dynamic duo, whose attitude embodies the famous Aretha Franklin and Annie Lennox song Sisters Are Doing It for Themselves. As Miss Mckenzie explained: “The preparation has been tough, but that’s fine when you get the opportunity to take part in a world event. “There’s not a day when I am not doing some sort of training, either rope work in the evenings, or running, rowing or doing weights at other times. “The trip is costing roughly £1,500, so we have been saving money and the team has been organising various things like a ceilidh night and we also have a crowdfunding page. Miss Mckenzie took up the sport when she 12. Her father, Dave, is the coach at Cornhill, which has become one of Scotland’s powerhouses in tugging rivals into the dust. Her colleague, Ms Bannerman, added: “I was delighted to be asked to compete for Scotland, and it has been brilliant to team up with Ayrshire for this competition because they are a great bunch. “The trip to South Africa is an expensive one, but the support we have received on our JustGiving page has been amazing. The pair fly out on Saturday and the action takes place from September 19-22. It will be a gruelling prospect for the Scots, but both are relishing the chance to tug their passion into the limelight.